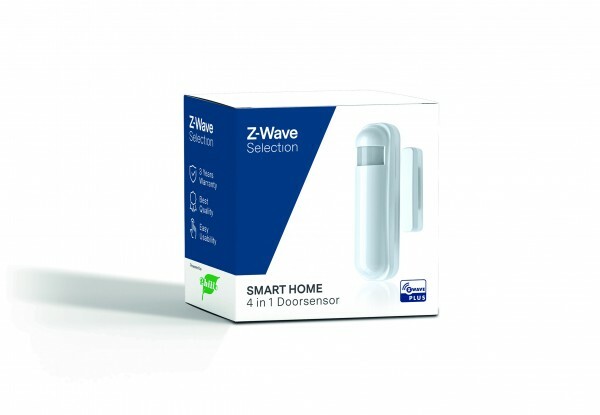 Product information "4 in 1 Door/Window Sensor"
The 4 in 1 Door/Window Sensor is a real all-rounder: It registers every movement, measures temperatures, detects different brightness levels and can also be used as a door/window sensor. It immediately reports all measured data to the Smart Home control center and thus enables various scenarios to be initiated. The sensor consists of 2 parts: a main part with sensor and a magnet. The magnet is attached to the moving part and the detector to the frame of the door or window. When the door or window opens, the magnetic field moves, causing the detector to strike and generate an alarm condition while the system is armed. The light sensor can also be used for light control by determining the light level, which can be passed to a Z-Wave switch. The switch will always turn on the light when the door is opened and the room behind it is dark. Each time the 4 in 1 Door/Window Sensor triggers, the sensor also sends temperature and brightness values - for example, they can be paired with a radiator thermostat and downshoot the heating if a window is opened. Related links to "4 in 1 Door/Window Sensor"